Is Putin's Nuclear Boasting For Real? So, what are these threatening nuclear weapons that Putin claims Russia now has? He began by describing the capabilities of the new super‑heavy (200 tonnes) intercontinental ballistic missile called the RS-28 Sarmat. According to Russian sources, the missile carries 10 to 24 independently targetable nuclear warheads for a total of 20 megatons or more. Putin said that this ICBM is the first to be able to attack targets from over the South Pole. In that case, its sub‑orbital trajectory would threaten America from its southern approaches and so bypass US ballistic missile warning radars, which face northwards to detect attacks from over the North Pole. It has a very short boost phase, which shortens the interval during which it can be tracked by satellites with infrared sensors. Putin went on to claim that Russia is also developing new types of nuclear weapons that render missile defence systems 'absolutely pointless'. One of them allegedly is powered by a small nuclear propulsion unit in an air‑launched missile called X-101. Apparently, it's a low‑flying stealth missile carrying a nuclear warhead 'with an almost unlimited range and unpredictable trajectory'. Putin claimed that 'no other country has developed anything like this'. Putin also asserted that Russia has a high‑precision, hypersonic air‑launched missile system called Kinzhal (Dagger). Again, he asserted that 'it is the only one of its kind in the world'. This missile is allegedly capable of flying at Mach 10 and delivering nuclear and conventional warheads over 2,000 kilometres. He claimed another technological breakthrough with the development of a missile that's a gliding wing unit. This new hypersonic‑speed, high‑precision weapon system called Avangard can apparently be fitted to an ICBM warhead and hit targets at intercontinental distances and engage in intensive manoeuvring as it travels. This makes it 'absolutely invulnerable to any missile defence system'. Once more, Putin asserted that 'no country in the world as of now has such arms in their military arsenal'. Putin said he hoped that everything he had just said would make any potential aggressor think twice, since unfriendly steps against Russia (such as deploying missile defences and bringing NATO infrastructure closer to Russia's border) 'become ineffective in military terms … making them useless'. 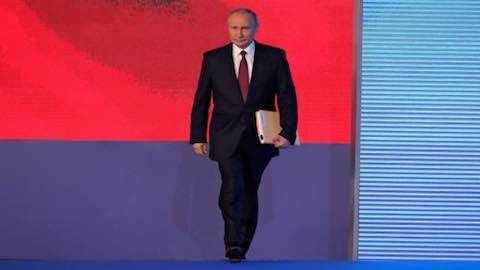 Putin's parting shot was a reminder that Russia not only reserves the right to use nuclear weapons in response to a nuclear attack, but also in response to an act of aggression using conventional weapons against Russia 'that threaten the very existence of the state'. Any use of nuclear weapons against 'Russia or its allies with weapons of short, medium or any range at all' will be considered as a nuclear attack, and 'retaliation will be immediate, with all the attendant consequences'. So, what are we to make of this resounding blast from the Cold War? Without access to highly classified intelligence, it's impossible to accept or reject Putin's claims about the technological performance of these new nuclear weapons. However, Pavel Podvig, the editor of the very informative book Russian strategic nuclear forces (The MIT Press 2001), has stated that Putin isn't exaggerating about Russia's new weapons. Nor is the existence of most of them a huge surprise. 'So, it is all feasible,' he said after Putin's speech. But why is Russia putting all this effort into defeating America's very limited ballistic missile defences? The answer probably is that Moscow continues to worry about a US technological breakthrough. The Pentagon's reaction was to observe that it has deployed no new nuclear capabilities for over two decades, but that it will replace its strategic nuclear triad over the next 10 years. The US can do this at a cost of only about 6.4% of the current Department of Defense budget. How then can Russia afford to embark on what's undoubtedly a hugely expensive nuclear arms build up when its economy is barely the size of Spain's, and when America's current defence spending is almost 10 times that of Russia's? So, we may be right to be pessimistic about Putin's claims and suspect that he was merely playing to his pre‑election domestic audience. Even so, there's also a risk that we may now be about to embark on a serious and destabilising nuclear arms race between Russia and America. Paul Dibb is emeritus professor of strategic studies at the Australian National University. Image courtesy of President of Russia. Europe: "Is Putin's Nuclear Boasting For Real?"